Cancer treatment using the nanofiber mesh with self-heating/anticancer drug release functions. 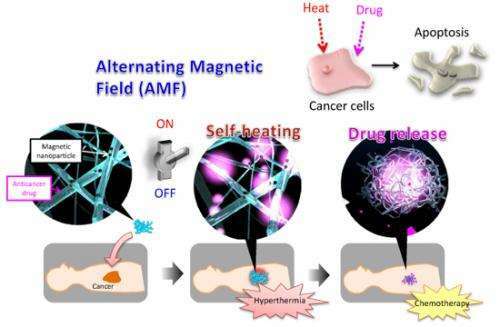 A research team from the National Institute for Materials Science has developed a new nanofiber mesh which is capable of simultaneously realizing thermotherapy (hyperthermia) and chemotherapy (treatment with anticancer drugs) of tumors. Using this nanofiber mesh, the team succeeded in efficiently inducing natural death (apoptosis) of epithelial cancer cells. Squamous cell carcinoma (SCC) is an epithelial malignant tumor, and is found in many tissues. For example, SCC is thought to account for more than 90% of esophageal cancers, more than 80% of the cervical cancers, and more than 30% of lung cancers. Although surgery, radiation therapy, and chemotherapy are now three main therapeutic methods according to the stages of cancers, in addition to these methods, thermotherapy has also attracted great attention in recent years. This is because it is possible to induce extinction of cancer cells by heat, as cancer cells are relatively susceptible to heat in comparison with normal cells. It has also been found that thermotherapy enhances the effect of anticancer drugs when used in conjunction with chemotherapy. However, when actually applying thermotherapy and administering anticancer drugs, the two independent therapies must be applied separately, and until now, precise control to realize treatment at the same time and same location had been difficult. In this research, the team led by Dr. Ebara overcame this problem and succeeded in development of a method for simultaneously performing thermotherapy and chemotherapy of epithelial malignant tumors. The team developed a mesh material which is applied directly to the affected part, and is a hybrid material that combines a temperature-responsive polymer, magnetic nanoparticles, and anticancer drugs. Although magnetic thermotherapy techniques which administer magnetic nanoparticles directly in the body have been developed previously, the difficulty of handling nanoparticles and the concerns regarding the safety of the magnetic nanoparticles themselves are the problems. The developed nanofiber mesh is easy to handle and can also be used in endoscopic surgery, etc. Moreover, because the magnetic particles contained in the fibers exist stably, diffusion in the body is minimized. For this reason, the developed method is considered to offer higher safety in comparison with methods in which magnetic particles are administered directly. As the nanofiber mesh contains magnetic nanoparticles, which are a self-heating substance, it is possible to heat the fibers by applying an alternating magnetic field. Furthermore, the temperature-responsive polymer contracts in response to the heat generated by the magnetic nanoparticles, enabling release of the anticancer drugs contained in the nanofiber mesh. When the anticancer activity of this fiber was investigated using a human melanoma cell strain, it was found that ON-OFF control of inducement of apoptosis of the cancer cells was possible by applying an alternating magnetic field. In 21st century, time-space control of the treatment of diseases is required. That is, it should be possible to administer drugs, etc. at an arbitrary timing and location. Because the newly-developed nanofiber mesh enables simultaneous ON-OFF control of heating of the affected part and drug release, simply by applying an external stimulus, it is considered to be a major advance in the development of next-generation therapeutic materials for 21st century medicine. This research achievement had been announced in the online bulletin of the scientific journal Advanced Functional Materials on June 14, 2013.